North Carolinians, Make Your Voice Heard NOW! Stand For Liberty! North Carolina Legislators need to hear from you NOW as they decide the outcome of our religious liberty! The Religious Freedom Restoration Act (RFRA) has been introduced in the House (HB 348) and Senate (SB 550). Click here to view the bill. RFRA ensures that every American regardless of belief system receives a fair hearing when government action seeks to force individuals to violate his or her religious beliefs. Should the government have a “compelling” reason to crush yours and mine, and other’s religious beliefs, the RFRA will ensure that our religious convictions get a fair hearing in court. Every American is guaranteed the freedom to live and work consistent with their faith without unnecessary government interference. The Government shouldn’t have a license to punish Americans for exercising these basic civil rights. The Founding Fathers knew government could very easily become a threat to freedom. It is the reason why they put very clear restrictions on government in our Constitution. RFRA helps maintain that vision by ensuring the government’s actions are not left unchecked when it comes to America’s first freedom: religious freedom. Urgent Prayer and Action is needed to pass the Religious Freedom Restoration Act. Pastors and congregations, Christian businesses, non-profit organizations, ministries, schools, families, all those who care about defending constitutional rights that guarantee every American the freedom to live and work consistent with their faith without unnecessary government interference …. Now is the time to pray and stand for religious liberty. PRAY: for the Governor and for Members of the North Carolina General Assembly to be guided by God’s wisdom and truth regarding the importance of passing RFRA as law. Please call Gov. McCrory (919-814-2000), President Pro Tempore Sen. Phil Berger (R-District 26) (919-733-5708), House Speaker Rep. Tim Moore (R-District 111) (919-733-3451), your representative and your senator. Urge them to support the RFRA legislation that has been introduced in the House (HB 348) and Senate (SB 550). Click here to find your legislator and their contact information. If time allows, call all Members of the North Carolina General Assembly – both House and Senate. Send an e-mail to the Governor and both your representative and senator with the links above. If time allows, send one to all members of the House and Senate. Make plans to attend the Legislative Day of Action on Saturday, April 28, in Raleigh from 9:00 a.m. to 2:00 p.m. Bring family, friends and church. Click here for information and to RSVP. Distribute this handout about the Religious Freedom Restoration Act at your church, business, neighborhood; share with everyone who cares about defending religious liberty. If you are a pastor, please inform your congregations of the urgency to pass RFRA. Forward this e-mail to like-minded friends, family, pastors, Christian business owners, non-profit organizations, ministries, schools and all those who care about standing for religious liberty in our great state. 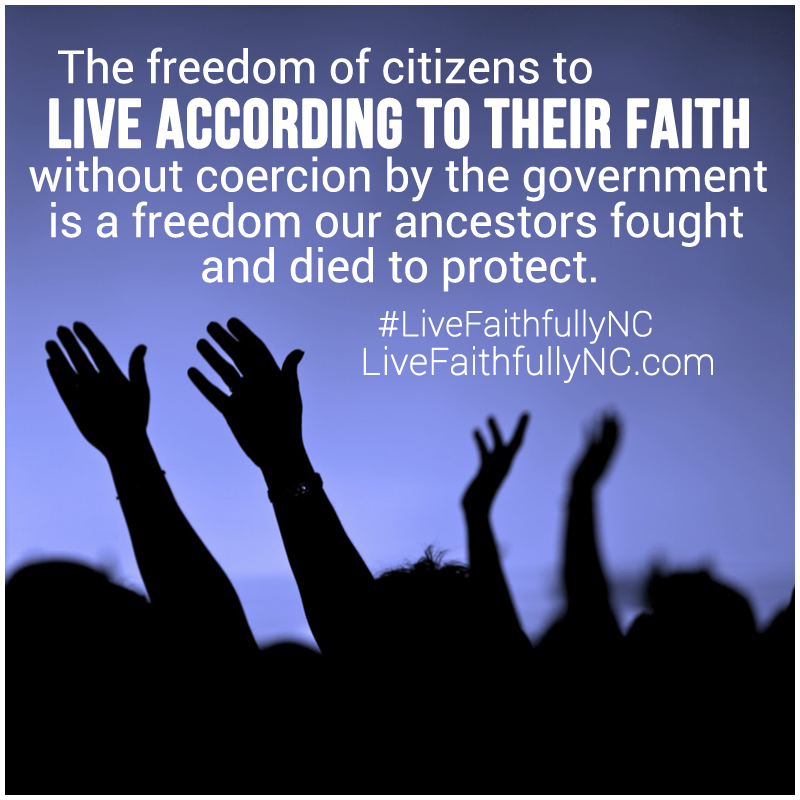 As a coalition member of Live Faithfully NC, CWA of North Carolina invites you to learn more about RFRA at LiveFaithfullyNC.com. For additional information on RFRA see our state website as well at nc.cwfa.org. Your faithful prayers and support are greatly appreciated, as together we make a difference to restore God’s righteousness to our great state. Donations to CWA of North Carolina may be mailed to P.O. Box 472903, Charlotte, NC 28247. Or, make it easy, donate online.